The EVERWARM car engine heater, plus sump heater and pre-heaters. Homepage. This page: More vintage and classic motoring accessories, the Everwarm 'radiator lamp' and later variations. Up until the mid 1920s, antifreeze was a little-heard of product, so the prudent car owner, or probably his or her driver, would have to remember to drain the radiator of its water every night in the colder months, to avoid the water freezing and cracking the radiator. Drains could usually be found on the engine block also, so they would need opening up also to protect the engine. Ethylene glycol anti-freeze would provide a solution to the problem, but its use even in the late 20s was not widespread. The other option available was to purchase a sump heater (examples of which can be seen further down). Fuelled by paraffin, these machines, usually quite flat and circular in appearance, were designed to be slid beneath the motorcar, the warmth radiating upwards and warding off the onset of frozen coolant within the engine. The unit shown alongside, the EVERWARM Radiator Lamp works in a similar fashion, but judging by the shape I think was designed to hang beneath the car's bonnet, hooking on one of the radiator support rods that would usually be found under the bonnet of cars from that era. Priced (in 1926) at 17/6, it consumed a miserly amount of paraffin. As well as reducing the chances of a cracked block or radiator, the constantly warm engine would usually be easier to swing into life on a cold morning, a handy benefit especially as starting handles were often the order of the day. Under-bonnet & sump heaters like this could still be found in use well into the 1950s, although by this time anti-freeze was easily available (for instance Fina Thermidor), and electric starters were standard fitment on new cars, so the need for such heaters began to tail off. I can't imagine they were especially safe either, positioned as they were in such close proximity to fuel lines, at least one carburettor, and in the case of some commercial vehicles, the Autovac unit. A drip from any of these fuel systems while the owner was lighting the heater could have been interesting! The use of a sump heater was a popular alternative to the underbonnet radiator lamp, again designed to keep the engine's temperature up on a cold winter's night. Powered by paraffin, a typical heater - such as that produced by Raydyot or Wingard shown in the image below - could easily run continuously for up to 400 hours on one fill of paraffin. All you had to make sure of was that it didn't run out during the night, leaving the engine to cool down once more, perhaps to a level where the water in the engine might freeze. A more elegant solution, but one that required the car to be parked in a garage, or at least near to a convenient power point, was the mains electric pre-heater. 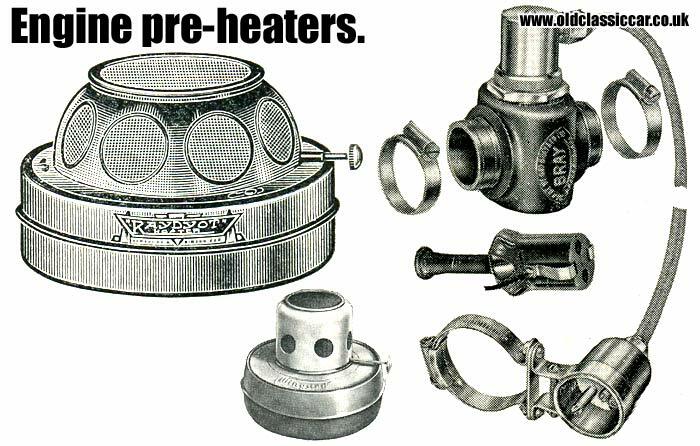 These can still be purchased new, but the example shown above dates to the late 1950s and was the Bray Electric Engine Heater. The main unit was installed within the bottom cooling hose of the engine, while a socket was attached to a convenient position inside the car - usually the car's steering column. A length of cable would extend from a 240v domestic power socket out to the car, presumably through a partially ajar door window, and be plugged into the socket. Acting like a household immersion heater, it would keep the temperature within the car's cooling system raised to a "safe" level. Other benefits included a saving in petrol, as the engine didn't require anything like as much use of the choke, and hopefully easier starting - an important consideration if you found yourself needing to use the handle on a wintery morning. It was also much more convenient to use when compared to a sump heater, and didn't require any topping up, or grovelling around underneath the engine to start it up. All a very far cry from today's gadget-laden cars, with in-built heaters for screens, mirrors, washer jets and seats in many cases.